When you’re preparing to cook up a storm, the actual meal you intend to whip up isn’t the only thing you should be thinking about. The reason for this is that you don’t want to cook a delicious, multi-course meal only to end up with your kitchen looking like a hurricane passed through it. Fortunately, there are some simple things you can do to keep your kitchen clean and tidy while cooking. It makes sense to ensure that your kitchen is clean before cooking a meal. Otherwise, your kitchen might not be sanitary enough for meal preparation. 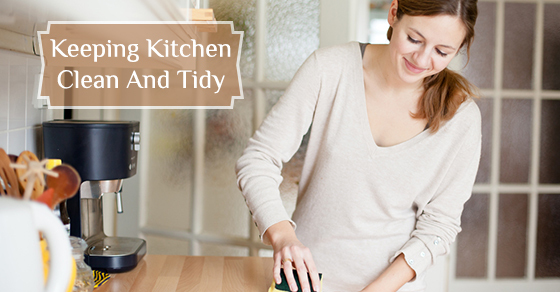 Also, a clean and uncluttered kitchen will give you more room to work with. Make sure that you have your garbage can, compost bin or recycle box handy so that you can discard of things appropriately and right away rather than resort to putting them on the countertop. Should you drop something or spill something, be sure to clean it up right away so that it doesn’t have time to stick. Left too long, you might have to do a whole lot of scrubbing. Multi-use products like a flexible cutting mat can help you on various fronts. For instance, you can, of course, use it to cut things on; you can also use it as a funnel to get chopped vegetables from the flexible cutting mat to the pot, and in doing this, you can help to keep your kitchen cleaner. Whenever you finish using a bowl, a pot or a utensil, put it in the dishwasher so that you can get them out of your way. As an alternative, you might want to fill a sink with hot, soapy water to place used items in so that they’re out of your way. Put things away when you’re finished using them. That way, you won’t end up with a whole lot of things you no longer need taking up space. Whenever you have the chance while cooking, you can wash up some of the dishes, pots or other things. This can help to reduce your cleanup time after you’ve finished cooking. As you can see, there are lots of things you can do to keep your kitchen clean while you’re cooking. So get cooking and enjoy a great meal in a clean kitchen.